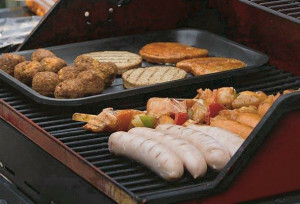 Summer is when the good days mean bringing out the BBQ grill and sprucing it up ready to cook our favourite BBQ foods. BBQ parties with friends and family are a great way to enjoy the good weather, good company, and good food. And, every summer the number of reported cases of food poisoning almost doubles. 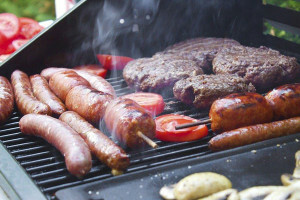 Sometimes the culprit is a barbecue grill rack that has built up grease on which bacteria thrive. BBQ racks are best deep cleaned and sanitised once every year. Many of our customers have their barbecues professionally cleaned in late spring or early summer to be ready for the good weather and dry days we sometimes do get in Scotland!. Before you use the BBQ, take a stiff wire brush and scrub the racks to ensure that they are smooth and free of any debris. Preheat the BBQ for 15 minutes, this will burn off and sterilise the cooking rack, allowing it to heat before use will help it to hold the heat more efficiently. Bring meat to room temperature before putting it on the BBQ, this allows the high heat to penetrate the meat easier and helps to stop tough dry steaks. Rapeseed oil is one of the best oils to use in BBQ cooking, it has a much higher burn point than the popular olive oil. It is also delicious drizzled on salads as well as to oil the BBQ grill. Always cook with the BBQ lid down. As well as stopping flare-ups it produces that authentic BBQ taste. The fats and juices from the meat drip onto the hot coals and give off an amazing aroma! Food will also cook faster in a “closed” barbecue. Leave a small section of the BBQ without fuel. This is your safe zone where foods can be placed to finish cooking away from the flame. This lowers the risk of barbecued meat staying raw in the middle and charred on the outside. Use 2 sets of tongs, to avoid the risk of cross contamination by having one for uncooked food and one for cooked food. Allow meat to rest when it comes off the BBQ, 10 minutes is enough for steaks and smaller pieces of meat. 30 minutes is recommended for roasts. Rest meat on a warmed plate and cover with tinfoil. Draping a dish towel over the foil helps to keep the food warm. When barbecuing, temperature is one of the best guides to judge if food is cooked through. The old adage “75 stay alive” is a good rule for ” barbecue chefs” to follow. Invest in a digital thermometer or meat probe and when you test the meat, aim for a temperature of 75C. at the thickest part of the meat. For subtle flavours, you can add different wood chips (such as hickory or maple) to the barbecue charcoal, TIP: soak wood chips for 30 minutes, drain and place on top of hot coals. When they begin to smoke it’s time to start loading the barbecue with the meat.